Cooking can be a fun activity for the culinary-inclined or a stressful chore—depending on how well you see yourself around in the kitchen. However, novice nor expert can deny that there is one thing no chef is prepared for: a kitchen fire. Whether you leave the stove unattended or catch a paper towel in the flames, kitchen fires can sneak up on you. 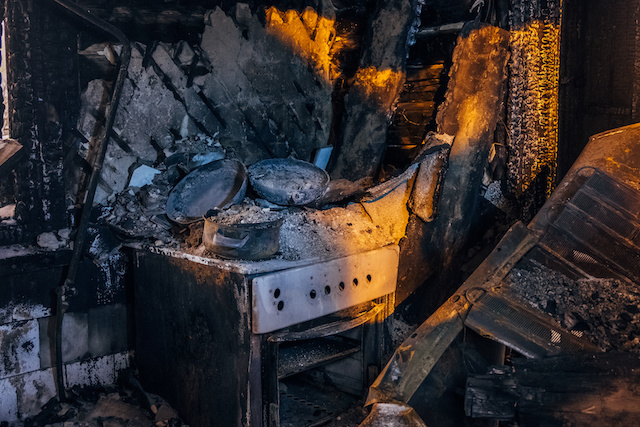 While accidents happen, kitchen fires can cause major damage to your kitchen and the entire home. Here’s how to handle a kitchen fire so you can minimize damage. When a fire is raging, salt cuts off the oxygen supply and helps you smother the flames. Keeping a handful at arm’s length from the stove is always best. Baking soda also works to put out grease fires, If a paper towel or pot catches on fire, you can use water to put it out. But, never, ever use water to put out a grease fire. A fire extinguisher is best kept in the kitchen in an easy to access spot, too, and can be used to put out any kind of fire—grease or otherwise. Once you’ve calmed the flames using baking soda, salt, or a fire extinguisher, make sure you turn off the heat on the stove, oven, or other appliance. As soon as you feel like you’ve done all you can do, get out of the house. Fighting the fire yourself, if it begins to get out of hand, can cause more harm than good—and you could even risk your life. It’s best to evacuate and call 911. Once you’re safely outside, call 911. Professional firefighters will be on their way in no time to help assist you and minimize damage. Once the fire has been put out, you can work with a reputable fire and smoke restoration service near Fort Collins, Colorado to restore your home to like-new condition. Did your kitchen fire get out of hand? Don’t worry. The #1 Fort Collins fire and smoke restoration service is on the way. After disaster strikes, the team at 970 Services will be there for you in a flash. We are a licensed and insured general contractor that operates as disaster and damage relief. We have the ability and expertise to handle everything on the exterior and interior of your house, top to bottom, and because of that, we will not leave your home until the job is complete. If you are ever faced with a disaster, like a house fire or smoke damage, remember to call a local, trusted home restoration company (like us!) first. Need assistance ASAP? Give us a call now at (970) 888-0970 or contact us online for a free estimate.